The Samurai Game® is considered by many to be the most unique, intense and challenging leadership and teambuilding experiential simulation available anywhere. Tens of thousands of individuals from around the world have participated in it, through organizational and corporate trainings & retreats, university and school leadership courses, and personal development programs.The Samurai Game® was invented, written, and first performed in 1977 by George Leonard, author, award-winning editor, musician, Aikido instructor and pioneer in the Human Potential movement. 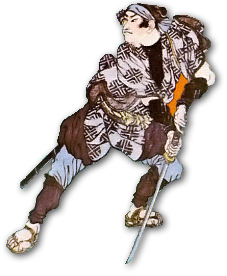 The Samurai Game® was copyrighted by George Leonard and is solely owned by The Leonard Family Trust. Roam this website to find more information about The Samurai Game®, answers to frequently asked questions, a listing of Certified Facilitators, and comments from people who have participated in it. Czy twój moderator posiada certyfikat?